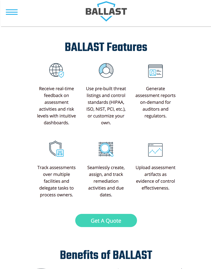 BALLAST is an online risk assessment and management software that was launched in 2017 by Tennessee-based firm, LBMC Information Security. As security and IT audit professionals, LBMC Information Security has been doing risk assessments for several years. The company decided to develop a SaaS based solution in response to seeing clients struggle to keep up with their risk assessment and management tasks on spreadsheets. 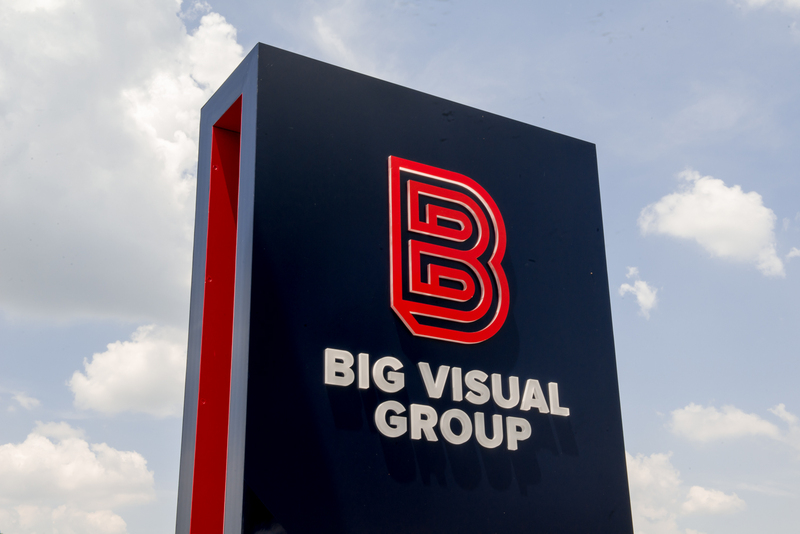 However, launching a new brand is never easy, especially in the highly-competitive software industry. BALLAST partnered with Green Apple Strategy to design a website that would help the company stand out from competitors and drive business by making it easy for potential customers to express interest in learning more. When LBMC Information Security first approached Green Apple to help launch the BALLAST brand, the only concept that was solidified was the logo. Over the next few weeks, Green Apple helped BALLAST developed a fully-comprehensive marketing plan that would highlight the solutions unique value proposition for the industry and define key marketing messages that would help BALLAST stand out from competitors. 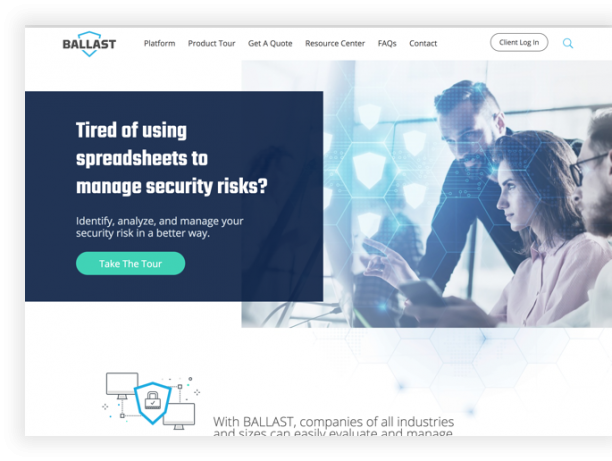 All of this information was used to develop a customized website specifically built to highlight BALLAST’s unique value proposition and drive potential customers to “raise their hand” to learn more. Green Apple also planned and executed a launch event at the popular Nashville eatery, Fin & Pearl. Once BALLAST’s core marketing messages were set, it was time to integrate them into the website for the official brand launch. Together, Green Apple and BALLAST landed on a website strategy and concept that would not only help the solution stand out from competitors but also optimize the opportunity to generate new business based on strategic content and user experience best practices. 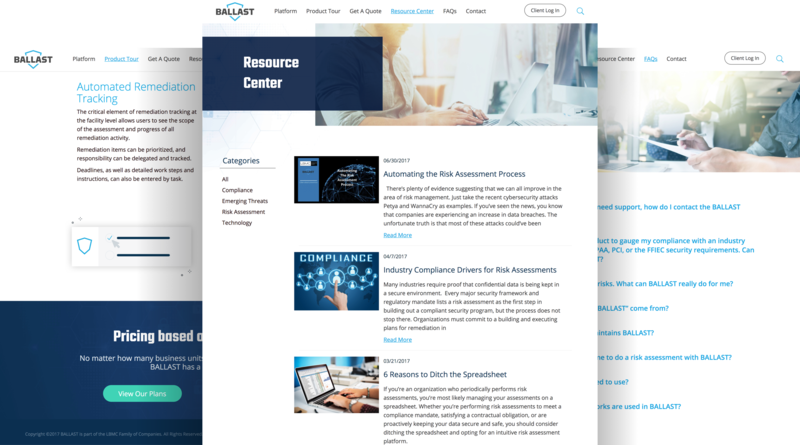 By intentionally including these three areas on their website, the BALLAST launch created the perception that the company wasn’t a simple startup but a trusted industry leader in the risk assessment and compliance industry.